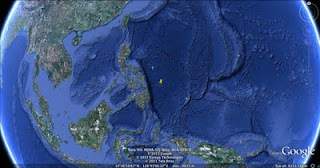 A Panamanian flagged Amver ship responded to a distress call from an American sailor in the Philippine Sea late Tuesday May 24, 2011 after his sailboat suffered steering and sail damage. The M/V Wangaratta, a bulker managed by the Misuga Kaiun Company, enrolled in the Amver system on February 11, 2011. 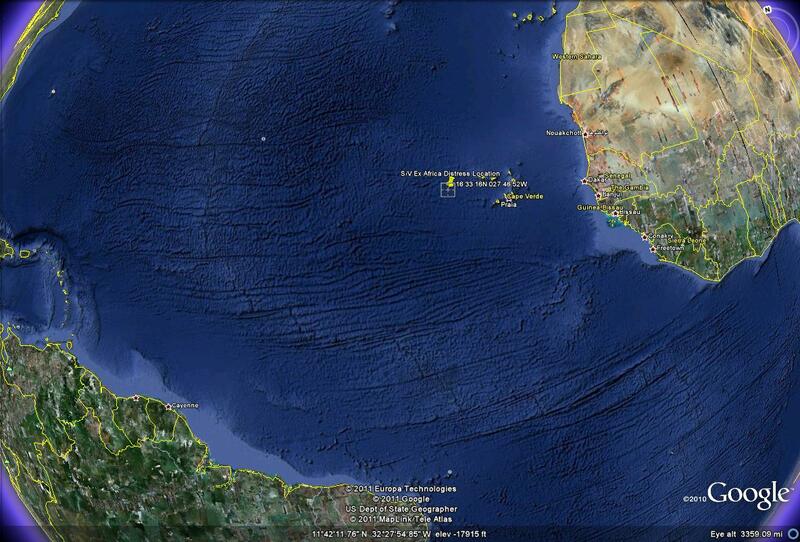 "We received a distress call from a sailboat and proceeded to the vessel," stated the master of the 751 foot ship. "We made three rescue attempts but were unsuccessful because of big waves and darkness," he added. After waiting for first light, the crew of the Wangaratta rescued Mr. Gary Ball and is taking him to their next port call. The damaged sailboat was left adrift. We're on the road this week. We just wrapped up the Amver awards ceremony in Washington, DC as part of National Maritime Day and we're headed to Norshipping for another awards ceremony recognizing Norway's contribution to Amver and safety at sea. 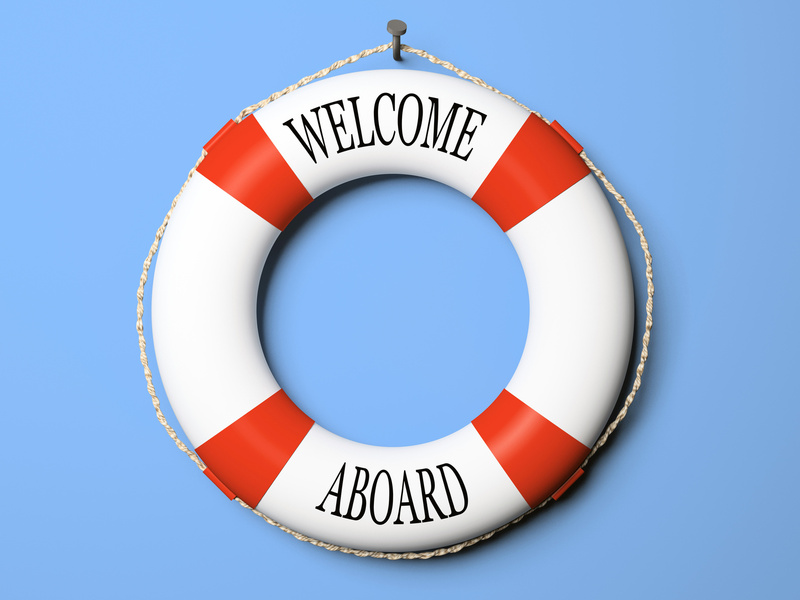 While we're away please help us welcome the last ships enrolled in the Amver system. If you're just enrolling you'll see we made a slight change to the Amver search and rescue questionnaire, or SAR-Q, so we can get your ship's Inmarsat voice number. Why do we need that? So when their is an emergency our search and rescue professionals won't waste precious time looking up your contact details. Are you listening to the Amver podcast Quarterdeck? The people that bring you Amver wish each and every mariner a Happy National Maritime Day. In times of peace or war, the civilians serving in the United States Merchant Marine have helped keep our Nation safe and prosperous. We depend on these men and women serving on our ships and tugs, in our ports and shipyards, close to home or far at sea, to connect businesses, service members, and citizens around the world. On National Maritime Day, we honor their invaluable contributions to America's economic strength and security. On May 22, 1819, the SS Savannah completed the first successful voyage by a steam powered ship across the Atlantic, shepherding in a new age of maritime travel and transport. By the 20th century, the United States maritime trade was booming, fostering exchanges across the world and aiding our military at war. During World War II, Merchant Marines were critical in providing necessary supplies and services to troops abroad, while suffering an extraordinarily high death rate. Hundreds of merchant ships fell to enemy action, and nearly one in thirty mariners did not return home. United States flag vessels and those who operate them continue to be an integral part of our military operations overseas. They support operations in Iraq and Afghanistan, as well as humanitarian aid missions and disaster relief efforts. Without the steadfast commitment of our mariners, our Nation would not be as prepared to deal with unforeseen events, conflicts, or crises. Their bravery and valor make our waterways safer and more efficient every day. Today, our maritime industry is a valuable source of skilled employment for American workers, contributing billions of dollars to our economy. It is also a critical part of our transportation system. Last year, my Administration implemented "America's Marine Highway Program," an effort that enables American businesses to participate in improving the safety and environmental sustainability of our waterways. Our mariners' continued work is helping American industry remain competitive in the global economy, pushing us toward a more prosperous and free 21st century. NOW, THEREFORE, I, BARACK OBAMA, President of the United States of America, do hereby proclaim May 22, 2011, as National Maritime Day. I call upon the people of the United States to mark this observance and to display the flag of the United States at their homes and in their communities. I also request that all ships sailing under the American flag dress ship on that day. IN WITNESS WHEREOF, I have hereunto set my hand this eighteenth day of May, in the year of our Lord two thousand eleven, and of the Independence of the United States of America the two hundred and thirty-fifth. A reader of the Amver blog and cruiser shot this great video. It shows the Amver participating cruise ship Celebrity Equinox assisting the 43 foot catamaran which suffered engine failure 850 miles east of Bermuda. Can't see the video? Just click this link. 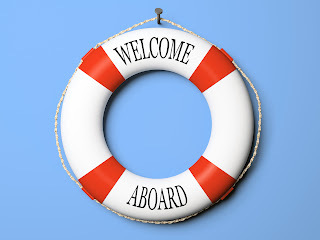 The Quarterdeck; Amver rescues and boardings, oh my! Welcome to episode 4 of the Quarterdeck, the monthly Amver podcast featuring Benjamin Strong and Admiral Jim Watson. In this episode we discuss some of the recent Amver rescues and have an interview with U.S. Coast Guard Commander Amy Beach of Sector Long Island Sound. Commander Beach discussed what crews can expect when sailing to a U.S. port. 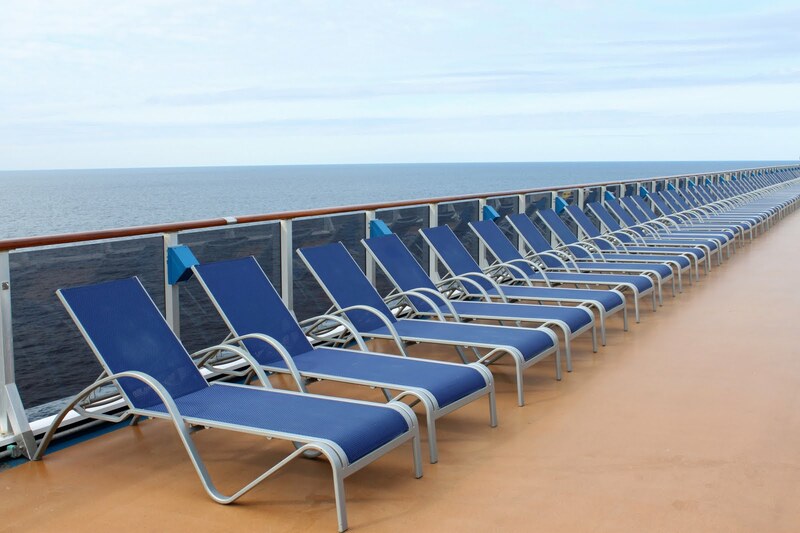 Would you like to hear something specific on the Quarterdeck? Leave your question in the comments and we'll do our best to answer it in an upcoming episode. And don't forget to leave a review if you download us in iTunes. Every time we learn of an Amver ship that performs a rescue we send a note to the shipping company thanking the Master and crew of the vessel for a job well done, for giving hope. We also ask for any photos or video that may have been taken by the crew. Finally, we request a short narrative from the Master or crew. "I for one as Master did not call to mind that one day I will be into a real rescue operation. It is not an everyday experience wherein someone can memorize and predict the moves. But saving lives where you were caught in a situation struggling against the forces of nature is one of the toughest job to do. The motivation on the part of crew that a single light from far would mean the lives of two yachtsmen was the driving power to locate the life raft despite heavy rains that restrict the visibility. By going back to company’s basic policy that preservation of human life is high lighted, the company willingness to support the vessel to answer and respond the call of distress whenever requested will always be there. With God’s guidance, the consolidated effort of Master and crew of M.V. Daio Azalea and determination of Stella Cometa crew to survive that made it all a successful rescue operation." Captain Sinoy summed up what Amver was founded on, ensuring no call for help going unanswered. The crew of the Caio Azalea and Kawasaki Kisen Kaisha Ltd. answered the call. Thank you, all of you. We're busy preparing for the U.S. Amver awards, but not too busy to recognize the latest ships enrolled in the Amver system. We'll also be in Oslo, Norway hosting an Amver awards ceremony at Norshipping. Will you be there? We've also had some remarkable rescues in the last few days. You can read about them here and here. In the meantime please help us welcome the latest members of the Amver team! Thanks for continuing to support Amver. 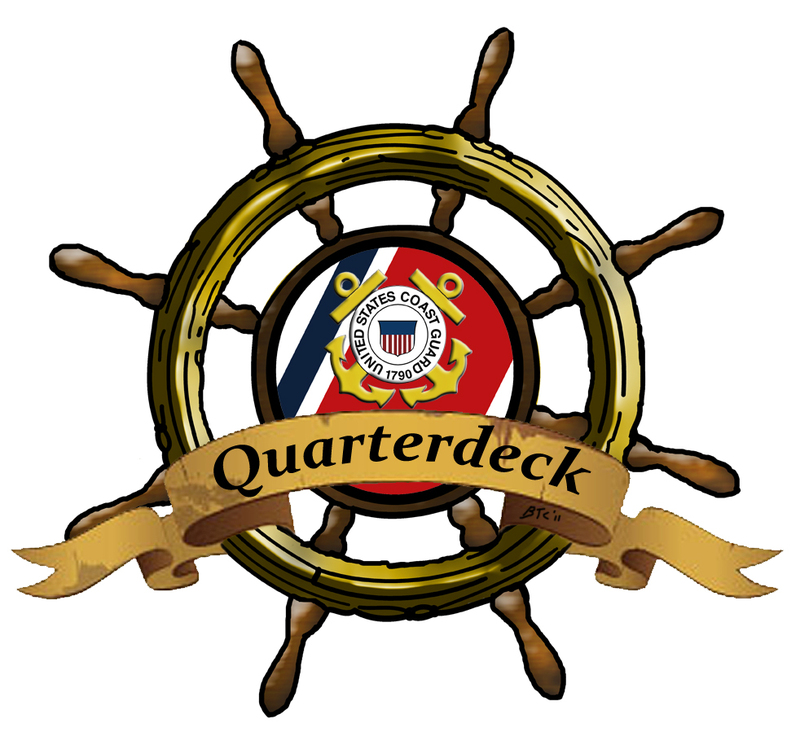 Are you listening to the Quarterdeck podcast? It started with an Amver Surface Picture request sent to the U.S. Coast Guard by rescue authorities at MRCC Rabat on Sunday May 15, 2011 and ended with three Brits and a South African rescued by a British research vessel headed from Antarctica to the United Kingdom. That was the report sent to RMRCC South Africa by the crew of the 57 foot sailing yacht Ex Africa early Saturday May 14, 2011. " South African rescue personnel made a call to MRCC Rabat about the stricken sailboat and handed over search and rescue coordination. Rescue personnel in Rabat quickly requested Amver data from the U.S. Coast Guard and began calling the stricken yacht on their satellite phone. "We have damaged rigging, we're out of fuel and water drifting in bad weather and we are abandoning the yacht," the crew reported. Among several ships that responded to assist was the Royal Research Vessel James Clark Ross. 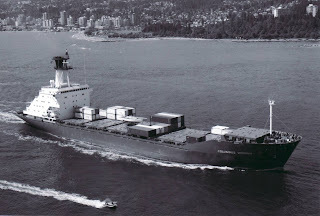 The Ross, a long time Amver participant, headed to the distress location and assumed SAR command from the Kate Maersk which had also diverted. The four sailors were quickly hoisted aboard the Falkland Island flagged research vessel which was sailing from Port Stanley back to Portland, UK. We're proud of the James Clark Ross and its crew. Hopefully stories like this will encourage more ships to enroll in the Amver system. Interested in learning more about the rescue professionals that work in rescue coordination centers around the world? Then check our our story about these unsung heroes. This falls into "The truth is stranger than fiction" category. A recent Twitter update alerted us that a sailboat had been crushed by a whale off the coast of Oregon. The name of the sailboat? 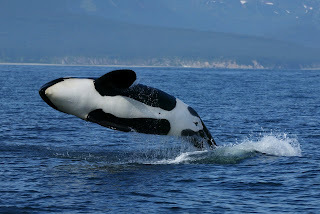 According to a report from KVAL.com the 38-foot sailboat was taking part in a race to Vancouver, British Columbia when a whale came out of the water just feet from the starboard side. The beast crushed the mast and rigging as it fell back into the water. A 47-foot motor lifeboat from U.S. Coast Guard Station Cape Disappointment responded to the scene and escorted the sailboat back to Astoria's West End Basin Pier. What's this got to do with Amver? It doesn't matter what may happen, sailors need to be prepared. File a float plan and have an EPIRB. If you need to be rescued, we'll be there for you. 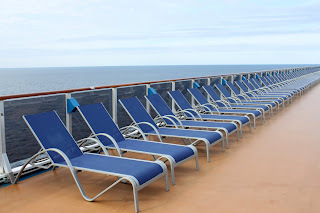 We never thought we would be writing about an Amver cruise ship defending itself against a ruthless pirate attack with deck chairs but that very scenario unfolded aboard the MSC Melody back in 2009. The details of the attack came to light after one of the elderly cruise passengers settled a lawsuit with the cruise company. John and Barbara Jeffrey were with a group socialising on deck late at night when they first spotted a small boat following their liner, then looked on in horror as a pirate attached a rope to a lower deck and began shinning up it. The holidaymakers threw everything they could at the man and he finally fell into the sea when a German hit him with a flying deckchair. We certainly don't advocate the use of furniture as a means of thwarting pirate attacks. In fact, the U.S. Maritime Administration offers a good helping of best practices that ships should use when sailing through pirate infested waters. In the meantime, keep calm and carry on! An Amver participating bulker, the Daio Azalea, rescued two Italian sailors early Wednesday morning May 11, 2011 after their 43 foot catamaran sank 900 miles east of Boston. One sailor suffered a minor head injury in the rescue operation. U.S. Coast Guard rescue personnel received notification from rescue authorities in Rome that the catamaran suffered a broken mast and was taking on water. Coast Guard personnel queried the Amver system and diverted the Panamanian flagged ship to the distress location. The Daio Azalea was only 28 miles from the stricken sailboat. "We took a big wave and broke our sail and a window," reported one of the sailors on the Stella Cometa. "We are unable to pump water, have our life jackets on and our life raft ready." The weather was deteriorating as waves increased to 15 feet and winds were gusting over 40 knots. "I have a visual on the vessel," the Captain of the Daio Azalea reported, "but the situation is worsening." 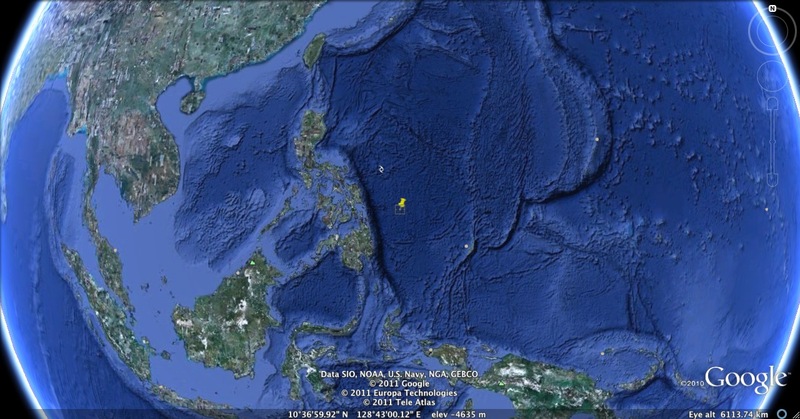 The crew of the Daio Azelea found the two sailors in a life raft and began rescue operations. 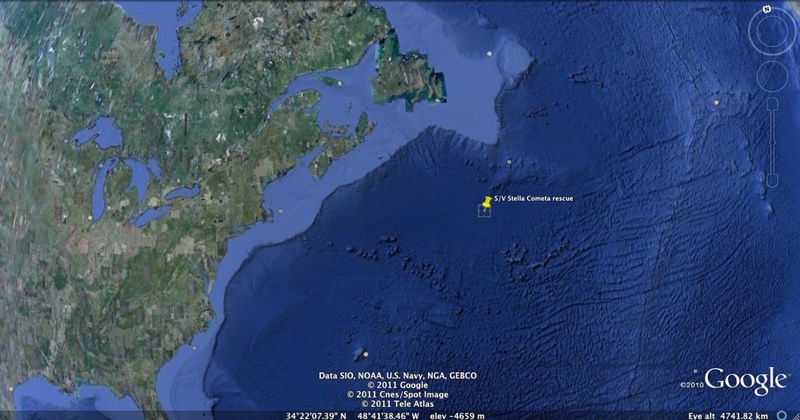 Almost four hours after the Coast Guard learned of the incident the two Italians were safely aboard the 656 foot ship. The catamaran sank. The Daio Azalea, managed by K Lines of Japan, enrolled in the Amver system in 1995. The survivors will accompany the ship to its next port call in Turkey where Italian authorities will meet the yachtsmen. Who enrolled in the Amver system in the past week? Another 30 ships enrolled. Perhaps your vessel's name is below. We hope you decide to join our team. Your participation offers hope, and hope is the last thing to die. Image by Harry-Harms via FlickrThe Amver participating cruise ship Celebrity Equinox rendezvoused with four German sailors aboard the sailboat Lady Freda and passed along diesel fuel to close out a dramatic rescue situation unfolding since late Friday May 8, 2011 850 miles east of Bermuda. The German yachtsmen then continued on their journey. The Celebrity Equinox, owned by Royal Caribbean, enrolled in the Amver system July 27, 2010. Rescue coordination centers can always request Amver data from the United States Coast Guard, the process is easy. Five German sailors sent out a distress notification that their 43 foot catamaran was in trouble with a broken mast and inoperable engine 850 miles east of Bermuda late Friday afternoon May 6, 2011. Rescue authorities from the U.S. Coast Guard and Rescue Coordination Center Bremen, Germany were able to locate and divert the cruise ship Celebrity Equinox using Amver. The Celebrity Equinox, owned by Royal Caribbean, enrolled in the Amver system on July 27, 2009 and has earned Amver awards for continued participation over the last two years. 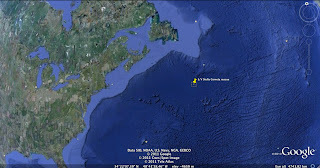 The German sailors were on a voyage to the Azores, Portugal. The Celebrity Equinox was on a voyage from Fort Lauderdale to Europe. We'll update the blog as we learn more about this case. Originally printed in the Amver Bulletin 01-92 from Spring 1992. The German flagged Amver participant Columbus Virginia rescued 19 survivors from two 10-man lifeboats after they abandoned ship in the South Pacific, about 143 miles northeast of Kanton Island. 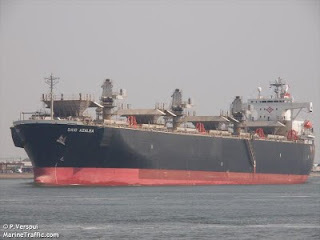 The 19-man crew, consisting of one Kenyan, one Turk, and 17 Pakistanis, fled the freighter Independencia as the vessel started taking on water and listing heavily to port. The survivors embarked the liferafts with an Emergency Position Indicating Radio Beacon (EPIRB), and a hand held radio. The U.S. Coast Guard deployed a C-130 from Air Station Barbers Point to coordinate rescue operations the morning following the abandonment. About 17 hours after the crew abandoned the St. Vincent-registered Independencia, the plane located the liferafts. Columbus Virginia, the nearest vessel in the area, was identified and requested to divert to affect the rescue. Roughly three hours later, the Columbus-class ship picked up the survivors and brought them to safety at Honolulu Harbor. The vintage 459-foot Independencia was reportedly on its last voyage to the scrapyard when it began taking on water. The vessel was traveling from Ecuador to Whampoa, China, and once it started taking on water, attempted to reach safe haven by heading toward Kanton Island. 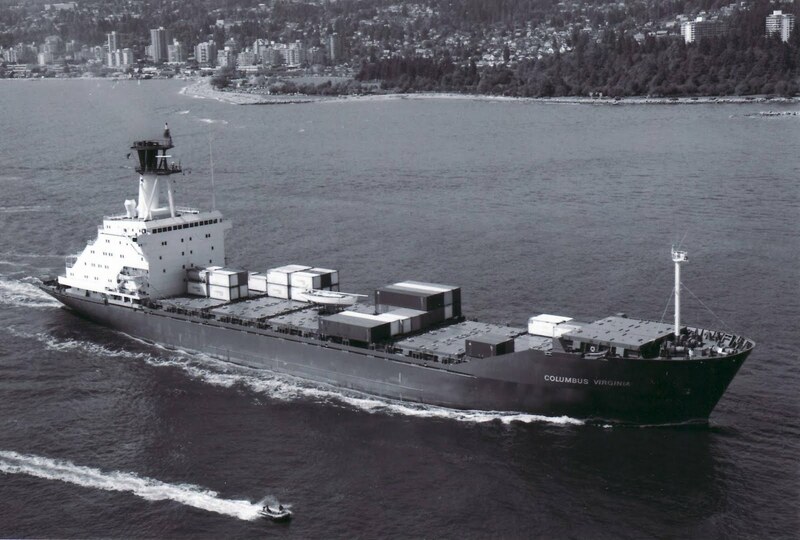 The Columbus Virginia, a Hamburg-Sudamerikanische Company container ship, has been an Amver participant for 14 years. Amver Bulletin extends a well done to all hands in the air and aboard ship for making this rescue look easy, and continuing a "Safety at Sea" tradition. A 43 foot Norwegian sailboat with four people aboard was headed to Antigua when they became disabled approximately 950 nautical miles east south east of Cape Cod, Mass. and notified United States Coast Guard rescue personnel Wednesday May 4, 2011. The crew said "... the winds and seas are too rough to control the vessel...". Winds were reportedly 45 knots with waves in excess of 15 feet. Coast Guard personnel diverted the Amver participating tanker Stolt Vinland. The Cayman Island flagged tanker turned towards the distress location when the sailboat captain reported he had some control back and did not require additional assistance. 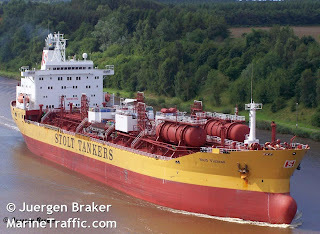 The Coast Guard notified the 33,000 dead weight tanker, managed by Stolt Tankers, they were no longer needed and the Stolt Vinland returned to its original course. The sailboat crew agreed to say on a two hour communications schedule with rescue authorities and agreed to activate their Emergency Position Indicating Radio Beacon if they developed any other problems. It's that time of the week again. Time to recognize the latest members of the Amver network. Maybe your ship is listed below. If so, we're thankful. Haven't enrolled yet? Just click this link and follow the simple instructions. There are so many ways to report to Amver you'd be hard pressed to find an excuse why you won't join. In the meantime, help us welcome the newest Amver members. Want to learn more about Amver? Check out our informational video. 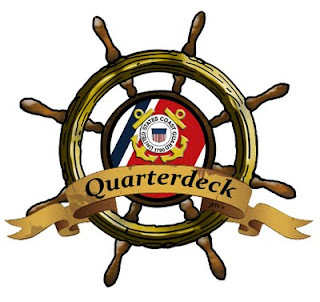 Listen to the Quarterdeck podcast here. Once you learn about us, you may want to help us ensure no call for help goes unanswered. Welcome to episode 3 of the Quarterdeck, the monthly Amver podcast featuring Benjamin Strong and Admiral Jim Watson. In this episode learn what went on at the recent Arctic Shipping Summit in Helsinki, Finland and the United States Coast Guard's efforts in the Arctic. We also feature an interview with Craig Eason from Lloyd's List about his time on a Sovcomflot tanker sailing from Murmansk to the Varandey terminal and back.